Keeping a rental property clean and free from pests is one of the main responsibilities of a landlord. In fact, failing to do so is usually a violation of government building and safety codes, so you could easily find yourself stepping afoul of the law. This isn't even to mention the damage that rodents can do to your property investment. Mice might be tiny creatures, but they leave very clear signs when they've entered a home. But you still have to know what to look for to determine whether they've invaded your premises so you can then take the necessary steps to evict them. Always keep a close eye on your property for the first signs of pests because infestations can develop very quickly. There are certain times when it is particularly important to look for signs of mice. Mice don't hang out in the middle of rooms. In most cases, they don't want to encounter you any more than you want to meet up with them. Look for signs off the beaten path. A mouse will usually travel the perimeter of a room, so look for droppings along the baseboards. They particularly like corners where they feel safe, and mice like to relieve themselves in safe spots, so you'll likely find droppings here, too. They'll leave oily marks on the walls if they've rubbed up against them in their travels. Mice need water. They'll use leaky pipes as water sources, or they might even chew through plastic piping to get to the water inside. Check under the bathroom sink and the kitchen sink for damage. Mice often build their nests near food sources. Look for holes, droppings, footprints, or gnawed bags in kitchens or pantries. Consider moving larger appliances like the oven or refrigerator away from the walls so you can take a peek behind them. Both tend to provide warmth and sometimes moisture, a pleasant environment for mice. Mice often build their nests in basements or attics because they'll be undisturbed there. They can still climb along walls and pipes from these places to get to food sources. Mice are nocturnal, so you're not likely to come nose-to-nose with these little invaders at high noon. They'll leave certain clues behind nonetheless, and you'll be able to see these in the daylight. Like all creatures, a mouse will relieve himself after he eats. His droppings will be small pellets, about ¼ inch long, with pointed ends.​ If they're shiny, they're recent—you have an active population in residence. The mice might have departed the premises if all the droppings appear dry and crumbled. You probably have a whole family of mice if droppings seem to be of different sizes. This indicates that both adults and juveniles are relieving themselves. You might notice a hole in a wall or in molding. It doesn’t have to be large and, in fact, it probably won't be. 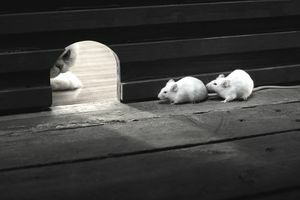 Mice can fit through cracks as small as a quarter of an inch.​ Why would they go to the trouble of gnawing a bigger hole when they can squeeze through that tiny opening just fine? You might notice a musky odor, or you might even be able to smell their urine. This will be especially noticeable if you have a large infestation. If you see a mouse, dead or alive, it's likely that there's more than one in your property. He's probably moved in with his whole family. Mice don't tend to travel alone. Your best chance of actually spotting a mouse is at night. You might also be able to track the mouse to get a better idea of where the nest is. Watch where he scurries off to when he detects your presence. Always examine the premises for signs of mice when you first buy a property. It will be easier to see the problem and much easier to get rid of the rodents before you have tenants living in the unit. Look for signs of mice when a tenant moves out. It will be easier to take care of the problem before the next tenant moves in. How Do You Know It's a Mouse? It can be difficult to determine if the rodent living in your property is a mouse or something else, such as a rat. Nonetheless, there are clues. Mice also have smaller feet than rats. Their footprints will be about 3/8 of an inch long, whereas a rat will have a large foot, between ¾ and one inch. Rats will also drag their tails, so you might find this type of disturbance in dust.